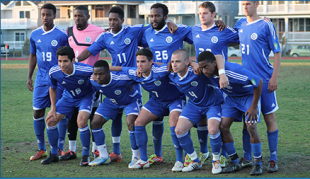 The USL-PDL Ocean City Nor’easters began their 2013 campaign with a definitive victory against the New York Red Bulls U-23 side, dispatching the academy team 2-0 at Carey Stadium in the US Open Cup. With the win, Ocean City is booked into the second round of the tournament, against USL-PRO team Pittsburgh Riverhounds. The first half began with some cagey play from both teams, with neither able to break through the midfield. New York rolled out a high line against the home team, which would prove to be their undoing. Spreading the field with a 4–3–3 look, Nor’easters began working the flanks and using their pace. The first real chance was from Marcus “Duke” Lacriox, OC’s speedy wide man. He gathered in a pass, took it up the left flank, only to push the ball achingly wide of New York’s goal. Ocean City began creating more chances, with two cross in the box in the 9th minute that came to naught. The breakthrough came in the 15th minute when Lacriox again came streaking up the flank after a long ball from goalkeeper Keasel Broome. Lacroix gathered the ball and bore down on New York keeper Max Brown. From there the finish was easy and the Nor’easters were up 1-0 over the academy side. And there was no looking back for the Jersey Shore team. This was truly a game of clashing styles, with Ocean City spreading New York wide and using their ample pace, where the Red Bull U-23 team played a tight, stacked midfield in a 4–5–1 setup. The chances the academy team created were fleeting and never really sustained. The second half started much more evenly, with New York asserting itself more with better interplay in the midfield. But that didn’t last as Ocean City again attacked the wings with pace. This time, forward Frank Tweneboa was the main factor in creating havoc in the New York defense. He pushed up the right side with a great run, beating two men along the way to put in a brilliant cross that Nicolas Perea was able to bury for the home team. Lacriox wasn’t done either. He earned his Man of the Match status throughout the game with his pacey runs and the chances he created. A late rush by Red Bulls at the end wasn’t enough and, with the win, Ocean City Nor’easters booked themselves into a second round match with the 2-0 shutout. Coach Tim Oswald said after the game he was happy with how well his team came together, with the players only getting into camp 5 days ago. With their league opener on the road Saturday against Central Jersey Spartans and the US Open Cup second round match at home on Tuesday, coach Oswald says he plans on preparing like every game is a championship match. if they play the riverhounds as well as they played redbull, they have a great chance of advancing to the 3rd round. i think the program said that OC would be hosting that round too! i think the seagull crap covered field was of great benefit. win and play philly union at ppl park . we will give our all to get to ppl park. thank you fans for the support you gave us past tuesday.